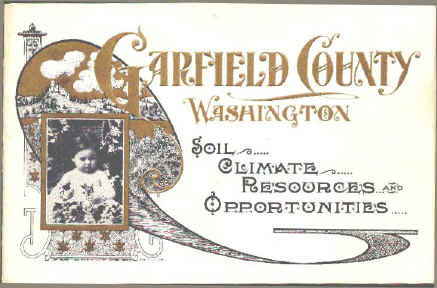 "The county of Garfield occupies the extreme southeastern corner of the territory, being bounded by Snake river on the north and east, Oregon on the south and Columbia county on the west. It is the youngest county in Washington territory, not yet having passed the first anniversary of its creation. Its area covers nearly thirty-six townships or about 1,300 square miles, the majority of which is good agricultural and grazing land though considerable fine timber exists in the south end of the county, where a spur of the Blue Mountains juts into it over the Oregon line. Settlements were made along the route of the stage road from Walla Walla to Lewiston on the Pataha and Alpowa as the line was established in the spring of 1862. "The land in that region was used and considered good only for grazing purposes for many years, until 1870 when a few persons on Alpowa ridge and Pataha prairie raised crops of grain that soon drew many to locate farms in those fertile tracts. Settlement in other portions of the county was slow, owing to the fact that lands nearer the Columbia were not all taken yet. At the time Columbia county, including this region was formed in 1875, there were probably less than 200 settlements in the section now forming Garfield county and a total population of not more than 500 souls. "No town existed and no attempt to build one had been made other than the establishment of a post office on the Pataha for the accommodation of those living along that stream. The next few years witnessed a great change. The Pataha prairie and Alpowa ridge filled up with settlers, the rich lands along Deadman were taken and emigrants poured into and located upon a large proportion of the rich agricultural soil of the county though much excellent land yet invites the immigrant to make a home upon it. Columbia Center appeared in 1876, Pomeroy, Pataha City and Asotin City in 1875 and a number of points for shipment of grain were established along the Snake river. 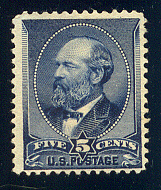 "As the population thus increased and the valuation of taxable property became greater the people felt more and more the injustice of having the county seat located in the extreme west end of the county which compelled them to travel many miles to transact official business or attend court terms at Dayton. Added to this general sentiment there was local feeling of rivalry between Pataha and Pomeroy that led them to desire the county seat for the commercial advantage and consequent ascendancy over it rival that the possession of that prize would bring to the town fortunate enough to secure it. The removal of the county seat from Dayton to some point on the Pataha was extensively discussed in 1880, the project impressing favorably those whose interests would be benefited thereby while those whom such a move would injure were adverse to its consummation. The citizens of Dayton were deeply interested in keeping the seat of justice in their thriving town; those along the Tukannon desired its location at Marengo or some other point on that stream; while the settlers still further east wanted it placed on the Pataha or some convenient locally in their end of the county. The people of Dayton began to realize that possibly a majority of voters were in favor of a removal though as yet divided in their opinions as to the proper place to locate it and they felt that at any time a combination might deprive them of that which had been an important factor in building up their town. "This matter apparently slumbered until a short time before the legislature met in the fall of 1881, when the people of Pataha prepared a petition requesting the legislature to provide for the county seat removal or to call an election to permanently locate it. The news of this move came to the people of Dayton at the time they were shut down from the world by the scourge of small pox that had fastened upon the town, and they at once realized the danger menacing them. To do nothing was to lose the county seat. Some of the wiser ones saw clearly that even if the movement was temporarily defeated it was certain to be successful in the end and at once advocated the creation of a new county, which idea the Pataha people endorsed and thereafter worked to accomplish that object. With but little opposition the following bill was passed and received the Governor's signature." Rotunda of the U.S. Capitol Bldg.. The picture above is taken from a booklet published in 1908 to entice businesses to move to Pomeroy and Garfield County. Pictures and text from the booklet will be uploaded to the Pomeroy site in the future. 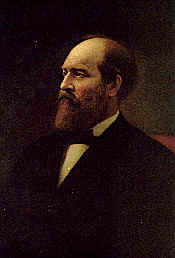 GARFIELD, James Abram, a Representative from Ohio and 20th President of the United States; born in Orange, Cuyahoga County, Ohio, November 19, 1831; attended district school; at the age of seventeen was driver and helmsman on the Ohio Canal; entered Geauga Seminary, Chester, Ohio, in March 1849, and at the close of the fall term taught a district school; attended the Eclectic Institute, Hiram, Ohio, 1851-1854; was graduated from Williams College, Williamstown, Mass., in 1858; professor of ancient languages and literature in Hiram College, Hiram, Ohio; president of Hiram College 1857-1861; member of the State senate in 1859; studied law and was admitted to the bar in 1860; during the Civil War entered the Union Army; commissioned lieutenant colonel of the Forty-second Regiment, Ohio Volunteer Infantry, August 21, 1861, and promoted through the ranks to major general; resigned December 5, 1863; elected as a Republican to the Thirty-eighth and to the eight succeeding Congresses and served from March 4, 1863, until November 8, 1880, when he resigned, having been elected President of the United States; appointed a member of the Electoral Commission created by act of Congress approved January 29, 1877, to decide the contests in various States in the presidential election of 1876; elected to the United States Senate on January 13, 1880, for the term beginning March 4, 1881, but declined to accept on December 23, 1880, having been elected President of the United States on November 4, 1880, to which office he had been nominated on June 8, 1880, in the Republican National Convention; was inaugurated March 4, 1881; on the morning of July 2, 1881, while passing through the Pennsylvania Railroad Depot in Washington, D.C., was shot by Charles J. Guiteau; died from the effects of the wound, in Elberon, N.J., September 19, 1881; interment in Lake View Cemetery, Cleveland, Ohio.